Fairy garden parties are dreamt of by girls young and old. Gorgeous looking finger food, cupcakes, fairy lights and flowers set the scene for a magical celebration of your special little girl. Here are some tips to kick start your own fairy garden party. Including a fresh flower with your hand delivered invitation is a cute touch. Fairy dust (glitter) is inexpensive and fun to sprinkle in the envelope with the invitation. You could include a hair clip with a flower on (available from most variety shops) in your invite for your guest to wear to the fairy party. Choose a small section under trees, next to bushes or a hidden away place of the garden to host your fairy garden party. Bring out the Christmas fairy lights from storage and string them up in the garden to set the scene for your party. String the lights over bushes or on low hanging braches to create a beautiful backdrop. Get creative. Draw some fairy/ flower outlines on white cardboard and let the birthday girl decorate them with glitter and colour them in in the week leading up to her party. If you need some pre-party therapy, join in the creativity – it’s good for the soul! Cut the pictures out, pierce a small hole in the top and string them from trees and shrubs in the garden. What would a fairy garden party be without fairy bread? For something different, try using a cookie cutter to make stars, hearts or flower shapes out of the bread. A picnic rug or tablecloth spread out on the ground under the trees will add to the magical experience. A pitcher of water with sliced strawberries inside is a lovely drink idea; this gives the water a refreshing sweet flavour. It also looks gorgeous and is much healthier than soft drink for your guests. Pass the parcel is one of my all-time favourite party games and I love that the end prize can be adapted to suit any party theme. Some flower bulbs or cupcake kit would make a perfect prize for your garden party. A craft activity (making bracelets or necklaces) is also a fun way to entertain your guests while staying in theme. Pretty little cupcakes on a silver cupcake stand would make a perfect fairy garden birthday cake. A few drops of pink food dye in the mixture before baking will give them a true fairy feel. Most supermarkets sell small edible sugar crafted flowers which you could use as cupcake toppers, or buy some edible glitter which you could sprinkle on top of the icing. 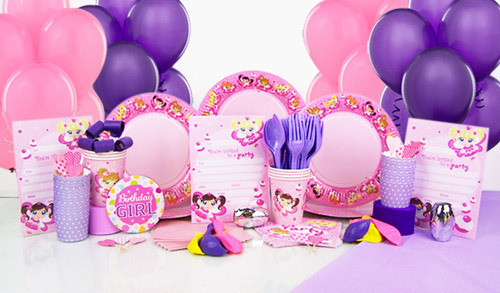 Fairy themed stationery, princess tattoos, bracelets, bubbles… all these are options with your Party in the Box party favours. You could also include a pretty hair tie or ribbon to thank your guests for coming.